« Julia Riley interviewed on ABC radio! We have found that the learning ability of the Tree Skink, a lizard that lives with family, is not linked to growing up with others. These lizards were able to learn to navigate a complex spatial maze whether they lived by themselves or with a ‘roomate’. This result was surprising because previous studies have shown that for social animals, like humans, rats, rhesus macaques, and chickens, being removed from social contact during development, negatively affects how they grow up. Individuals raised alone are more fearful, anxious, more sedentary, less social, and have a harder time learning. Yet, no one has studied how being raised away from from the social group affects growth in other, less-obvious, social animals – like reptiles. Australian Tree Skinks (Egernia striolata) are a common lizard found throughout southeastern Australia. In the wild, these lizards are often found in family groups – most often parent(s) and offspring are found together. However, each lizard varies in how social they like to be – there are loners, lizards that tend to spend most of their time alone, and social butterflies, lizards that are always found with other lizards. Their variable social nature make the Australian Tree Skink a desirable species to study how a social environment can affect their behaviour during development. Myself and my PhD supervisor, Martin Whiting, from Macquarie University’s Department of Biological Sciences teamed up with Dan Noble from the University of New South Wales in Sydney and Richard Byrne from the University of St. Andrews in Scotland to conduct these first examinations of how social environment can affect lizard learning ability. We raised Tree Skinks alone, or paired with another juvenile from just after birth until they were about a year in age. Then we presented each lizard with a complex spatial maze – each lizard had to navigate a set of five ladders and three ledges to access a food reward. Only 2 of the 5 ladders were climbable, and we measured how long it took each lizard to learn the correct path. Our study’s findings, published in Animal Cognition, were unexpected! 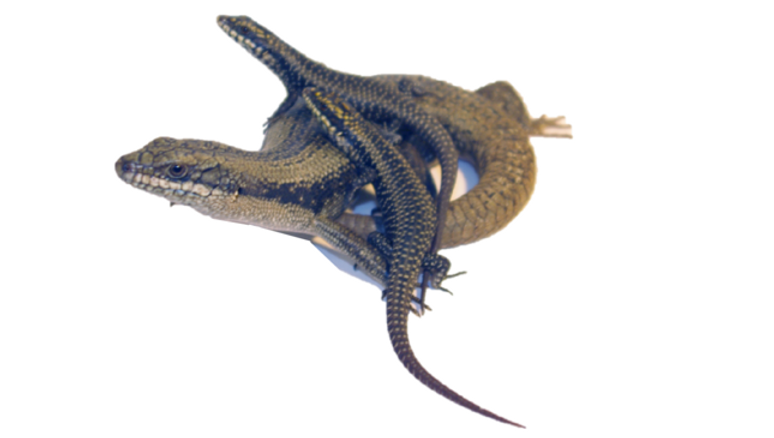 Unlike social mammals and birds, we found no evidence that the social environment they were raised in affected their learning ability – almost the exact same number of skinks from each treatment learnt this complex task! We think there are key reasons for this unexpected result, Tree Skinks naturally vary in their individual sociability, so growing up alone may be a normal option in the wild and is less stressful for them. Alternatively, the presence of a parent while growing up (which we did not measure) may be what affects development of tree skink learning ability.